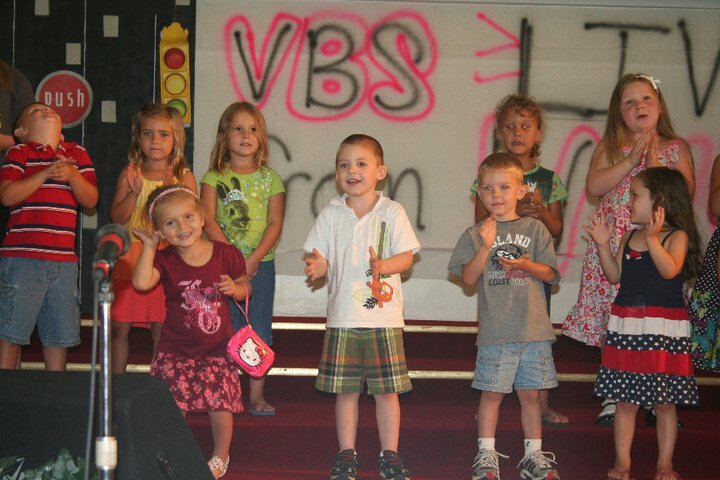 Jackson (in the center with a white shirt) sings at VBS family night. In front of a packed house Thursday evening, my little boy got up with his friends and sang his heart out for Jesus. My joy may have matched his while I watched Jackson’s face beam as he sang and did all the motions to the songs. Lauren squealed and pointed out her brother. She was proud, too! Jackson has been a natural performer since birth, and loves to sing and act out stories. But, he has also struggled with stage fright. There have been many times when he just lost it as he looked out into an audience or would refuse to get on stage altogether. There is nothing that pleases me more than when I see my children connecting with God. My heart overflows when they grow in their understanding of His love and express their love back to Jesus. God feels the same about you and me. There is nothing God wants more than for us to be close with Him. He deeply desires for us to grow in His love and enjoy His gift of grace. He longs for us to talk with Him, to ask Him the hard questions, to share His words with others. He is the proud parent watching His children get on stage and sing. When Jesus obeyed His Father and was baptized, God was so proud He could not keep silent. The Holy Spirit descended upon Jesus like a dove, and God spoke audibly to the crowd and to Jesus, “This is My Son, in whom I am well pleased!” This was the first time Jesus demonstrated to the people around Him how He would rescue them from the chains of sin and make a way for us to have a restored relationship with the Father, through His death, burial and resurrection. And, because of His obedience to God’s redemptive plan for mankind and submitting and pledging His very life for you and me, God loudly spoke His pleasure over His Son. Today, I want to please my Savior. I submit my life to His plan, no matter where that leads. I want to hear Him say He is pleased with me. If that’s your prayer, too, I know we have work to do as we filter our lives through His forgiveness and faithfulness. When we shift off-key and our voices falter, I will remember that God’s love never wains for His children. He loves us, not because of what we do or don’t do, but because we are His children. And as I accept His love and He shapes my heart and life, I want to make Him proud.